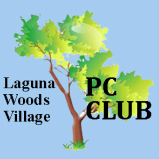 The Laguna Woods Village PC Club was started in 1984 by Al Bloom, and was composed of volunteer supervisors who helped users in the computer room in Clubhouse 1. Club meetings were held informally in member manors. In 1996, 6-week sessions of basic computer classes were offered on Works for Windows, and a study guide was created - 150 people enrolled in the classes. In 1998 the Club moved to the annex building adjacent to Clubhouse II with one room for the computer Workshop and a second room for a Learning Center. New courses were offered (intermediate skills, spreadsheets, Picasa, digital imaging, and the Internet), additional sessions were added, and the class size was increased to 13. Software taught in the Learning Center was also installed in the Workshop to offer students a place to practice. All teachers were volunteers and members of the PC Club. Throughout this developing period, the Club held monthly meetings and SIGs (special interest groups), presenting topics and information to help community members get more enjoyment from their computers. In 2002, when GRF and PCM operations were moved to the Community Administration Center, the PC Club was assigned a room for our Workshop, and another for our Learning Center. ​As previously, the Club continued to take full responsibility for the management and operation of the facilities, and for the upgrading and maintenance of the equipment. Since the move, the PC Club has increased the class size to 20 and increased the number of Workshop computers to 32, while making many improvements in computer equipment and furniture. Most of these expenses have been paid for out of PC Club funds. The PC Club is a non-profit community service organization of volunteers. The goal of the PC Club is to assist, teach, and inform all residents of ways in which they can get more productive and enjoyable use from their computers. In the Learning Center, we offer a variety of computer classes, based on the needs and interests of a majority of the residents. In the Workshop, computers, with staff to assist, are available to all residents. Club funds are received from annual memberships, class fees, and user donations. These funds are used to purchase and maintain the computer equipment, the facility furnishings, and to pay daily operating expenses. We offer the community a cost-effective service using our knowledge and experience in computer operations to take care of most needs directly, without having to use VMS. Justin Webb was an early and strong supporter of the Laguna Woods Village PC Club. He used his hands-on skills to maintain the computers, his photography and computer knowledge to teach Photoshop, and his business skills to help guide the club and get funding. Justin also served as the Treasurer of the Club. Justin’s contributions and his life were cut short in 2004 by a terminal pulmonary disease. The LC was named in his honor by the PC Club Board. Before the Village moved to the current Community Center, the PC Club was located in a couple rooms in the Clubhouse 2 Annex (where the Video Club is located today). The facility was dark, power outages were frequent, and there was very limited space. Basic computer classes were taught, but the equipment was crude, and classes were small. Re-routing wiring in the walls and ceiling to enable moving the Teacher’s Station from the middle to the front of the room, and eliminating wiring on the floor.. Adding a portable microphone and video capability to the Teacher’s Station, and speakers in the ceiling. Replacing the portable cart-mounted projector with a clearer, brighter, remote controlled ceiling-mounted projector. Installing a custom (large as possible) screen on the front wall. Installing new computer-oriented student desks. The Workshop is staffed by volunteer Greeters and Supervisors who assist users as necessary. The Workshop, with 32 computers, is open 6 hours a day for 5 days a week and 3 hours on Saturdays to all residents. All computers have a Cable Internet connection, courtesy of GRF. Computers have the latest operating systems and are furnished with the standard Microsoft Office suite of applications. A network laser printer enables users to print their documents. Three of the computers are furnished with 22-inch monitors, scanners, tools to copy 35 mm slides, a color printer, and Adobe Elements, to facilitate digital photo users. All computer monitors have been upgraded to 17-inch flat screen, for better user visibility. Some computers are furnished with Zoom, an application to assist users who are blind and some of the PC Club staff are trained to assist these people. All computers are furnished with software taught in the Learning Center: for example, Picasa, a digital photo managing and sharing software. Programs are presented regularly to inform residents about ways to get more enjoyment from their computers, and to introduce new software and services. Programs are open to all residents. We worked with a presentation systems company to equip the Learning Center with a ceiling mounted projector, with the highest powered light available, and a large wall-mounted custom screen to help residents more easily read the material being presented by the teachers. We also have provided a microphone for the teacher, and installed speakers in the ceiling to help residents hear what is being presented. In the Learning Center we offer several four-or-five-week class sessions a year, offering a selection of subjects based on the needs and interests of the majority of residents. A few subject examples are: Digital Scrapbooks, You Tube, Buying a Computer, TurboTax, iTunes, Facebook, Buying Groceries and Banking on-line, Writing your Memoirs, Buying and Selling on eBay, Smart Computing technical services, Computer Security, Skype telephone service, Home Networking, Google, Astronomy, Music on your Computer, Genealogy, Laptops, Making CDs from LPs and Tapes, Computer Performance, etc. Typing training software is available to help new computer users get started. The PC Club belongs to a national organization of PC clubs. Our association with them has made us aware of the offerings of many other clubs, and it has helped us better understand and measure the unique service we offer to this community. We believe that the Laguna Woods Village PC Club computer facility is the finest senior facility in the country.